As you’re probably well aware by now, Zoo City won this year’s Clarke Award. I had intended to write (and, indeed, started) a review of it at the end of last year. For some reason, though, I never finished. As one could infer from my listing it as, in my opinion, one of the top ten SF novels in the last 10 years by women, I liked and rated this novel highly. Lauren Beukes’ well deserved win encouraged me to get around to finishing this off. I’d read Lauren Beukes début novel, Moxyland, on the basis of some positive reviews and plaudits from the likes of William Gibson. As it happened, my praise for the novel would be a little less fulsome than many others. Not that I think that it’s a bad novel, because it isn’t. I just didn’t enjoy it all that much; something about it (that I – frustratingly – can’t quite put my finger on) rubbed me up wrong. I did, however, see that Lauren Beukes is a talented author and wasn’t willing to write her off on the basis of one novel. I’m glad that I did because Zoo City is – as noted – excellent stuff. Zoo City is set in a current day, but alternate, Johannesburg. People display their guilt for their crimes with an animal familiar. In the case of the narrator, Zinzi December, this is a Sloth. Those who are accompanied by an animal (known as Zoos) are not looked upon favourably by society. It appears that in South Africa, the treatment of Zoos is not so bad as it is in other countries, but they are still ostracised, forced to live in the Zoo City of the title. Also, those who have become Zoos find themselves endowed with a magical power. In the case of Zinzi December, this is the ability to find items that people have lost. She is able to visualise a thread linking the person to their lost item, wherever it may be. Zinzi December had spent time in prison for her crime and, upon gaining her freedom, finding herself living poorly in Zoo City, she finds making an honest living difficult. She is able to make some money finding lost items for people, but she is always weary of anything too big or seemingly too rewarding. Especially searching out lost people. As she is also in debt – at usurious rates of interest – she works as a 419 scammer, sending and responding to emails promising huge wealth to gullible westerners. This is, unfortunately, work that she has no little knack for, having a background as a journalist. Zinzi December takes on what she thinks is a simple job. The retrieval of a treasured ring for a Mrs Luditsky – the gemstone is made from the remains of her late husband. Though she is able to retrieve the ring, upon attempting to return it, she finds that her client has been murdered. Her past crimes initially lead to her being taken in as a suspect, though it does seem that the police are doing so half-heartedly. She had protested that this is the only type of finding work that she wishes to do. However, as she is in a huge amount of debt, she finds herself pressured into a missing persons hunt. Though I think that it does seem that she also can’t quite resist. The hunt – for a famous popstar – allows her to find a use for her journalistic skills again that isn’t duping people into giving up their pensions. Beukes endows December with enough character and motivation that her decision to take the job on doesn’t seem too much of a contradiction of her earlier protests that she wished to keep her head down. You could complain that not all the motivations of the characters are believable. But I think that, especially in the case of Zinzi December, her lifestyle and the decisions that she makes are entirely understandable. Her past crimes and status as a zoo have left her beholden to others through debt and the obligations that this brings. In the case of her providing service as an email scammer, this helps to keep her on the right side of sympathetic. Early in the novel, she is used to convince the people that her boss is attempting to scam that the emails are accurate and that they are not being duped. She protests this just enough and we realise that while she could refuse to take part, the logic of her situation means that she is a victim of circumstance. She is having pressure applied to her and as she is a zoo, she will find it difficult to make a living honestly and clear her debt (though we do get the distinct impression that nobody actually wishes her to be free of her obligations as she will continue to be useful if she remains indebted). Not to say that this excuses email scams, which target the gullible and desperate, but it does explain her actions and allows for her later actions. I was willing to accept that she’d, in spite of her better judgement, take on a dangerous and high profile job. This novel is fast-paced, hip and full of a huge amount of contemporary and recognisable detail; the conflict that her boyfriend is fleeing is a real-world concern, email scams proliferate and, though social divides are obviously not signalled in the same way as in the novel, they are clear to see throughout the world. As well as this, she has included detail around African Black Magic. This helps to root the novel in the traditions of its location, although this is a little unfamiliar to me and I suspect many other readers. This isn’t a problem for me, however. Beukes has created a rich and compelling world, with a depth that elevates the (admittedly a little breathless towards the end) plot. It may be this that I didn’t quite enjoy about the first novel. There was a great deal going on in that and so it is with this, but I think that Beukes has definitely improved as a writer; I look forward to seeing what she does next. The other thing that this has over Moxyland is that it tends to stick with the main character for longer, so one does tend to care a little more about what happens to her. ‘They keep our animals in cages in another part of the prison. We don’t see them. When they want to torture us, they put them in the back of the car and drive away to Keti Bandar. The pain is unbearable. You scream, you vomit and you say anything. ‘My Cobra was with me when I was arrested. I was nine. The police saw me walking on the street with my Cobra round my neck and they grabbed me. They said I robbed a house. I didn’t do it, but they beat me until I said I did. ‘When they brought me here, they threw my Cobra into one room with all the other animals. The animals would bite each other and get infected and die. The Undertow would come every night for the prisoners. Too many people died. Now they keep the animals in cages, but they don’t let us see them, not unless we give a big bribe, a month’s salary for a guard. I don’t have that money. This approach works well, and Beukes writes well enough to inject enough character into these kinds of insets that they feel right and are clearly a part of the world she has created. Handily, since I read the novel first, she did a guest post over at Floor To Ceiling Books where she explains in greater detail. I like this approach. It helps to keep the novel fairly slim and is a less intrusive way of doing things than more standard ways of getting this information across to the reader. There is, then, a lot to like about Zoo City. The plot is fast-paced, the protagonist compelling and the conceit of a physical manifestation of guilt is a neat one which I enjoyed. 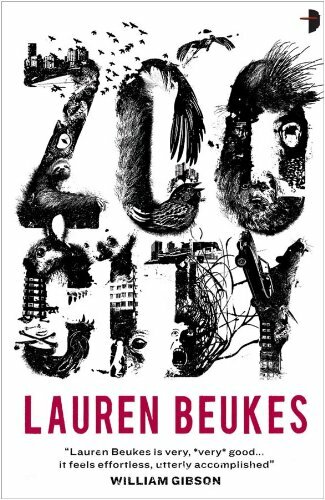 I’m even happier that Lauren Beukes has justified my decision to stick with her writing; this was excellent. I did enjoy her portrayal of the world, too. While, as you may have gathered from some of my other reviews, I don’t have any great objection to novels that have a political purpose, provided that they don’t end up clumsy and overly didactic, Beukes handles the many injustices and problems in the world deftly. Not least the fact that it’s set in South Africa, a country which, I’m sure that we’re all aware, has had more than its fair share of problems in the past. Strife is there, it’s a fact and not one that is ignored (as I say, the physical manifestation of guilt does point to, for example, the problems faced by criminals attempting to re-enter society and Zinzi’s boyfriend’s experiences illustrate the many violent and destructive conflicts that there are in African countries). These elements aren’t central, though, preventing the novel from becoming turgid. There are some caveats to this. I did enjoy the writing, it’s vibrant, witty and fresh and certainly feels very contemporary. This may not be to all tastes, though. The other thing is, as noted, the fast pace of the action in the novel while, on the whole to the good, does make the wrapping up of the plot not quite so satisfactory as it might be. But that – for me anyway – is minor. I’d rather have a novel that is fairly lean (as is this) and doesn’t feel as though it has an unnecessarily bloated word count to serve the plot. At the risk of a hideous cliché, the journey there was great. Highly recommended, a deserving winner of the Clarke Award (and ignore me, you should read Moxyland too). This entry was posted in Review and tagged lauren beukes, novel, south africa. Bookmark the permalink.